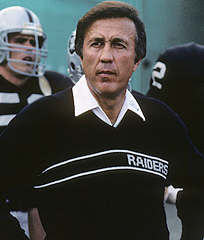 On February 8, 1979 the managing general partner of the Oakland Raiders, Al Davis, confirmed that Tom Flores would succeed John Madden as head coach. Madden had been highly successful, leading the club to 112 wins and a NFL title over the course of a decade, but he stepped down due to health concerns – more specifically, an ulcer. Just as he had done when he elevated Madden in 1969, Davis promoted an assistant coach with the team to the head coaching job. The 41-year-old Flores had been Oakland’s receivers coach since 1972 (he turned 42 before the season commenced). In contrast to the emotional and demonstrative Madden, Flores was quiet and calm. His elevation also made him the first Mexican-American head coach in NFL history. Flores had been an original player with the Raiders in 1960 and became the starting quarterback. He performed well for a poor team and led the AFL in completion percentage (54.0) in the league’s inaugural year. A bout with tuberculosis cost him the 1962 season, but he came back to play admirably under Al Davis, then himself the new head coach, in ’63. He was traded to Buffalo in 1967 and finished his nine-year career with the Chiefs in their Super Bowl-winning season of ‘69. Flores returned to Oakland as an assistant on Madden’s staff. After winning the Super Bowl following the 1976 season, the Raiders had gone 11-3 in ’77, losing the AFC Championship game to the upstart Denver Broncos, but then dropped to 9-7 and missed the postseason for the first time in seven years in 1978. 33-year-old QB Ken Stabler threw far too many interceptions. OT Art Shell and G Gene Upshaw, who had been stalwarts on the left side of the offensive line, were showing signs of wear. 36-year-old WR Fred Biletnikoff was also showing his age and was benched during the season. Similarly, the once-formidable defense was breaking down and veterans who had been obtained to fill holes, such as CB Monte Jackson, failed to produce as anticipated. In addition, trades to obtain veteran talent for the short-term had caused the Raiders to not have a first-round draft pick available for four straight years. There were still plenty of assets, of course. All-Pro TE Dave Casper was coming off his most productive season. FB Mark van Eeghen rushed for 1080 yards, and rookie HB Arthur Whittington showed promise. Linebackers Ted Hendricks and Phil Villapiano were consistently outstanding. With the added distraction of Davis fighting the league in order to move the franchise to Los Angeles, the Raiders again went 9-7 in 1979. Stabler bounced back from his subpar ’78 showing and benefited from heavy use of two-tight end sets that featured Casper and Raymond Chester. But the running attack ranked 24th in the league and the club was also 21st in overall team defense. With Pastorini starting, Oakland got off to a 2-3 start in 1980. But when Pastorini went down with a season-ending broken leg against the Chiefs, backup Jim Plunkett took over with outstanding results. The former first overall draft choice of the Patriots in 1971 had been cast off by the 49ers and was an afterthought on Oakland’s bench in ’79. Now his career was rejuvenated at age 33 and the Raiders went 9-2 the rest of the way. There were other factors in the team’s turnaround: unheralded RB Kenny King ran for 761 yards in tandem with van Eeghen and rookie MLB Matt Millen was an outstanding addition to the defense, as were veteran CB Dwayne O’Steen and FS Burgess Owens. CB Lester Hayes led the NFL with 13 interceptions, fifth-year ILB Bob Nelson finally hit his stride, and OLB Rod Martin achieved stardom. The Raiders finished second to the San Diego Chargers in the AFC West with an 11-5 record, defeated the Oilers (and Stabler) in the Wild Card round of the playoffs, squeaked past Cleveland in the Divisional round, and beat the Chargers for the AFC title. They then dominated the Philadelphia Eagles in the Super Bowl to become the first Wild Card team to win a NFL title. The unexpected Championship season of 1980 was followed by a precipitous drop in ’81. The Raiders went 7-9 and endured a stretch of three straight games in which they were shut out. Flores felt the heat following the franchise’s first losing record since 1964, in the second year of the Al Davis era, but was retained. The team finally moved to Los Angeles in 1982 – or at least played their home games there while they still practiced in Oakland - and rebounded to go 8-1 in a strike-shortened year. Rookie RB Marcus Allen had an immediate impact on the offense, while TE Todd Christensen went from unheralded backup and special teams player to star. With the usual emphasis on obtaining veteran talent, DE Lyle Alzado was added to the squad with good results. The Raiders fell short in the postseason, but the stage was set for another successful Super Bowl appearance in 1983. Although Plunkett struggled and lost his starting job to Wilson for a time during the season, Allen and Christensen were productive on offense, third-year DE Howie Long was selected to the Pro Bowl for the first time and the defense picked up another savvy veteran in CB Mike Haynes. LA finished strong and upset the high-powered Redskins for the NFL Championship. The team went a combined 23-9 over the next two years to again reach the postseason, but there were no further titles. The story remained the same – a strong defense, Allen’s running and Christensen’s receiving on offense, and instability at quarterback, with Rusty Hilger joining the mix. LA went 8-8 in 1986 and despite the acquisition of multi-sport star RB Bo Jackson, fell further to 5-10 in the strike-interrupted ’87 season. Flores stepped down afterward – likely under pressure. Flores’ overall record with the Raiders was 83-53, for a healthy .610 winning percentage, and a further 8-3 tally in the postseason that included two Super Bowl victories. The unflappable, low-key coach labored in the shadow of Al Davis, however, and never seemed to receive the recognition that his record might otherwise have drawn. It did not help change the impression that Oakland owed its successes more to the managing general partner than the coach when Flores became head coach and GM of the Seattle Seahawks in 1992 and the club went a combined 14-34 over three losing seasons. But his calm and steady leadership certainly was of benefit to the Raiders, particularly in keeping the team focused during periods of off-field turmoil, and none of the club’s other coaches – including the more highly-esteemed Madden – can match the two NFL titles achieved under Flores.